Sharing with and caring for the poor, "the rod of anger will fail". ATFG561 / Online Resource (Tune In) Part of a fam'ly interconnected / Community (Dave Brown) A song about being welcomed and how to work together as part of a community. "Part of a family interconnected, this is community; Welcoming strangers, visiting neighbours, this gives us dignity". Very singable song about building community. Good for kids. Free downloadable song book, lyrics and sound samples. Tune In / Online Resource Cover us with love (Elaine Loukes) This song may not be easy for congregations to sing, but it is great to listen to. “Be our vision Lord, in a world that’s filled with greed”...Free downloadable song book, lyrics and sound samples. *FFS48 May the anger of Christ be mine (Colin Gibson) Excellent words and very singable tune. Free sheet mucis and lyrics. TiS 674 / Iona (Common Ground, Heaven Shall Not Wait) / A&M562 / CH253 / SP245 Inspired by love and anger (John Bell) Powerful lyrics, simple English folk tune. Lyrics (search for "inspired"). I love verse three “Don’t query our position! Don’t criticise our wealth! Don’t mention those exploited by politics and stealth!”. It’s easy for us to be judgemental on these things. Unknown source (in BUC folders) Love in our hearts (Rod Boucher) Happy little song. Good for kids. Iona (Common Ground, HSNW) / CH362 / GtG773 / Srce213 / StF701 Heaven shall not wait (John Bell / Graham Maule) Challenging, uplifting words to a simple anglo-celtic tune. "Heaven shall not wait for the rich to share their fortunes...". Lyrics (scroll down). Recorded Music: The sharing song (Jack Johnson) A cute song from the soundtrack to Curious George. It could work well if you sing the first few lines as a chorus with the kids, or you could play the recorded version during the offering (!). Lyrics and video. Good for kids. Tune In / Online Resource Shepherd of the night (Elaine Loukes) "Have you ever felt the velvet night wrap you in her warmth". A lovely song with a theme of God’s protection. 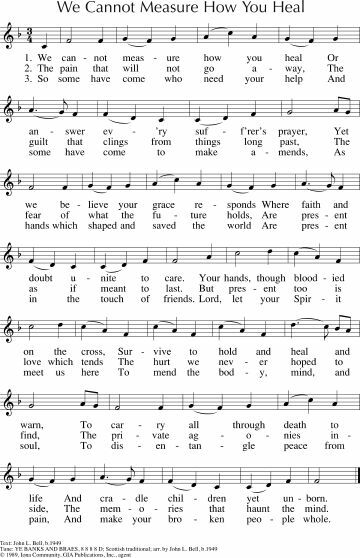 This is tricky for a congregation, so you might want to ask the musicians to play this. Free downloadable song book, lyrics and sound samples. PfAS125C Those who place on God reliance (Michael Morgan) I quite like this. It's kind of formal, with solid words and uses a lovely intuitive Hebrew melody HATIKVAH. PfAS125A Shalom shalom the peace of God be here (Bernadette Farrell) Excellent simple refrain, that could be used on its own, or as a Psalm refrain either with a cantored or spoken reading. "Shalom, shalom, the peace of God be here. Shalom, shalom, God's justice be ever near"; you could repeat it again at the end of the service as a blessing if you like. Sound sample (with different verses). Good for kids. 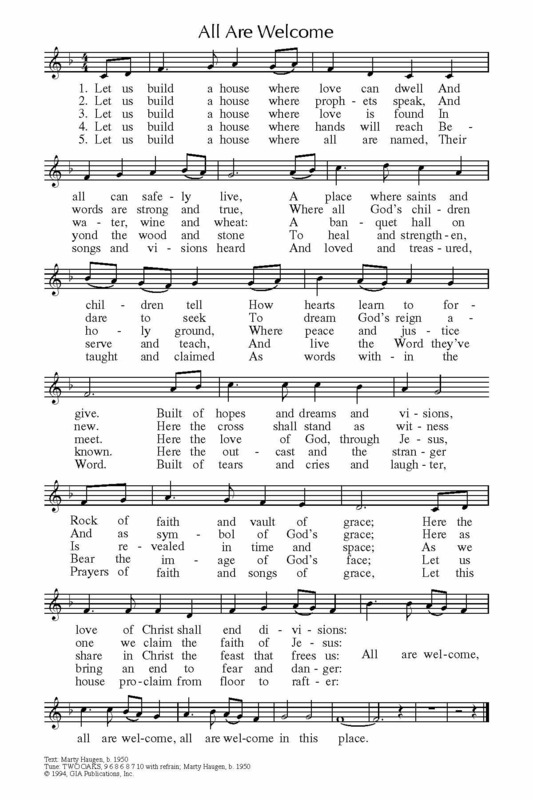 CH083 / A&M292 / GtG400 / PfAS122B / URW321 / StF026 / Lau992 I Rejoiced when I heard them say (Bernadette Farrell) This version is actually a setting of Psalm 122, but it is the same chorus as the above - so if you have these books, you can use the chorus as a refrain only which will still fit with Psalm 125. URW suggests passing the peace during the refrain if desired. Sound sample. AoVK-99 May the hope of God surround us (Schmidt) Simple blessing; could be good for the end of the service. *Online Resource Peace, Salaam, Shalom (Pat Humphries) The Psalmist also prays for the peace of Israel, and so should we. This is a beautiful and simple chant with two optional obligato lines. 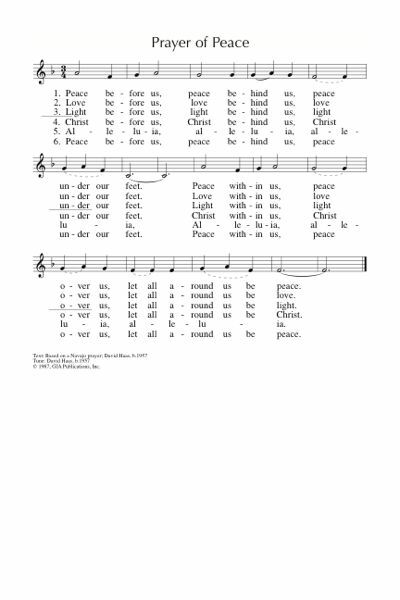 The congregation could easily sing the basic round as a meditative focus, or as a round for kids. Good for kids. Free sheet music. AoV1-091 / AoVK-68 / StS016 / G(II)527 / GC(II)720 / G(3)821 / LUYH923 Peace before us peace behind us (David Haas) love this one. Reflective. Careful not too get too schmaltzy because it's long. Less is more. It's good to do something while singing this song. I did a circle dance once upon a time, but I can't remember how it went. It works well at a walking pace. Schmaltzy and SLOW sound sample. Lead sheet. Good for kids. NCH Psalter 125 Do good, O God, to those who are good (Verne de la Pena) A simple cantored psalm for this psalm. The desert blooms, the weak are strong, the blind can see etc. Tune In / Online Resource Making things new (Sheree Anderson). A groovy one. Great for kids, and lots of fun. Sound sample, lyrics and free songbook. Good for kids. VU023 / CP104 Joy shall come even to the wilderness (Israeli traditional) A traditional Israeli song. Excellent words and the tune is cool. Lyrics. TiS 663 / NCH108 / CH241 / VU680 / GtG077 / PH337 / W&R532 Isaiah the prophet has written (Joy Patterson) Excellent words of Isaiah's vision for the future; I prefer to sing this to the tune JUDAS AND MARY (this is not the set tune in TiS). Lyrics (note: a different tune). AoV2-007 / AoVNG110 See I Make All Things New (Monica O'Brien / Trish Watts) I really love this song. “New, as night turns to morning, the spirit is calling I’m with you, I make all things new”. A nice sound sample. *G(II)249 / GC319 / GC(II)325 Close as tomorrow the sun shall appear / Walk in the Reign (Rory Cooney). I really like this one. “Close as tomorrow the sun shall appear. Freedom is coming and healing is near. And I shall be with you in laughter and pain to stand in the wind and walk in the reign”. Nice little lyrics twist there! The 4th verse mentions specific locations (Soweto, Gdansk, Tiannemen Square, The Bronx), which you could retain or change, as you feel appropriate. This sound sample gives it a bit of a gospel feel. Sheet music and lyrics. I think this song would be great for BUC this year, but I don't have a copy of it, and it's hard to get in Australia! ATW 427 Heat haze shimmering (Holmes) I quite like this. Very Australian. Though it's a weird time of year to sing it, if you are in Australia. 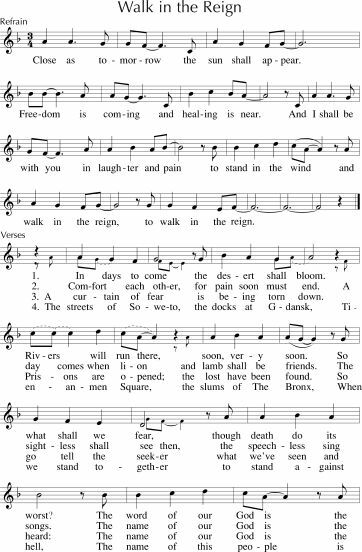 Might be best sung by your musicians if it is not yet known to your congregation. MV144 / SP&P073 Like a healing stream (Bruce Harding) Gentle folksy ballad with a lot of water imagery - healing stream, gentle rain, river strong and mighty sea. Would need to be introduced, but would catch on pretty quickly, I think. 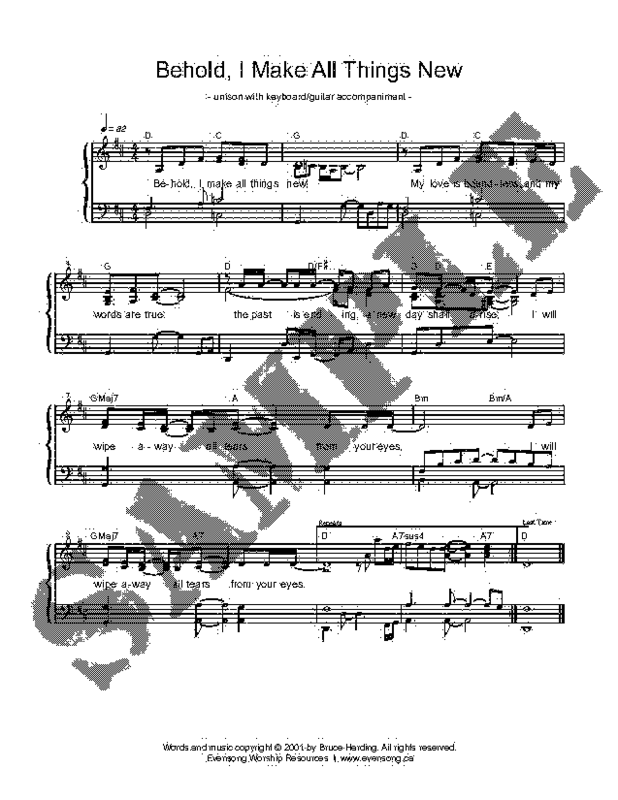 Sound sample, sheet music sample, and pdf for purchase. TiS 210 / AHB 141 / NCH42 / CH352 / UMH57 / VU326 / LBW42 / ELW295 / A&M742 / HPP74 / GtG610 / PH466 / CP306 / CP(E) 534 / W&R96 / Cha005 / Srce506 / 82Hml-493 / StF364 / MP496 O for a thousand tongues to sing (Charles Wesley) A classic. I particularly love NATIVITY for these words, and it's such a fun tune. Be careful with the words "ye dumb". Voices United has "Hear him you deaf, you voiceless ones, your tongues again employ" which is more respectful. We totally rocked this at church camp last year! Lyrics, sheet music. Oldy-but-a-goody. ATA 205 What you hear in the dark (Dan Schutte) An older contemporary song. The 4th verse fits particularly well with this reading. I'm sure this doesn't have to sound as 1970s-folk-mass as this recording... Sound sample and lyrics. SP&P020 We are waiting for you (Christopher Grundy) A gentle song of waiting. Would be good for the musicians to sing for the congregation during a meditative part of the service, or to commence the service. G(3)093 I will praise the Lord all my days (Michael Joncas) A lovely Psalm refrain, very straightforward. The verses could be sung or read. TiS 702 / NCH768 / SFFS 2014 / GC257 / GC(II)263 / G(3)331 / PfAS146B / Lau539 Alleluia 7 (Taize) A very straightforward Alleluia that builds with energy. PfAS uses this as a refrain to a cantored (or read) version of Psalm 146. Faith without works is dead. Do not favour the rich. *ATAR680 May our lives and our prayers be one (Paul Somerville) Excellent words about the nature of prayer, and how it changes our lives. An excellent song to sing before prayers of the people. You could also use the chorus on its own. *ATOK 412 / Iona (SBL, Common Ground) / CH250 / MV212 / A&M482 / GtG747 / SFFS 2184 / Lau855 / StF239 Sent by the Lord am I / Sent out in Jesus name / Enviado soy de Dios (Traditional Cuban) Great rhythm, good words and not too hard to sing (provided you sing it a little slowly the first time!) I prefer the MV translation "Sent out in Jesus' name". Good for kids. Lyrics. TiS 414 / CH616 / UMH192 / VU582 / A&M265 / HPP134 / PH433 / GC550 / CP(E) 198 / Cha257 / StF398 There's a Spirit in the Air (Brian Wren) A good song of getting the business of following Christ done. Speaking out, caring for others, being changed. Good, joyful tune too. Hymnals vary in the tunes they use. I like the TiS tune, which I tend to think of it in 6/8 instead of 6/4. Lyrics and sheet music. *Online resource I delight to do your will (Dean Spalding) This lovely simple chant is by Dean Spalding at Drouin Anglican. It's designed for repetitive singing, and builds beautifully with a number of (optional) parts. I'm not sure whether this is still accessible anywhere, but if you have a copy, now is the time to dig it out. On the road / Online Resource Mystery of servant love (Ross Langmead) Excellent song, with much feeling about Christ's suffering, death, and servanthood, and our desire to live with the same depth of love for others. Lyrics. The Syrophoenician woman, healing the deaf man in secret. Christ's mission extends to the Gentiles. Messianic secret. A lot of the songs listed above will also work for this reading. *Iona (Love From Below / common ground) / CH718 / VU613 / A&M522 / GtG797 / G(II)401 / GC575 / GC(II)558 / G(3)657 / CP292 / CP(E) 348 / W&R628 / SP140 / URW146 / Lau433 We Cannot Measure How You Heal (John Bell) Really very excellent words to a very familiar celtic air. Easy to sing; be careful not to get too fast; it's tempting but the words need a slower tune. Sheet music sample. Sound sample. TiS 326 / Iona (HSNW) Pull back the veil on the dawn of creation / Love's the secret (John Bell / Graham Maule) The tune is really pretty tricky, but if it is familiar to your congregation, it's a good song to sing. Can skip a few verses if it seems too long and it will still make sense. HiOS025 Ephphatha be opened my soul (Colin Gibson) Excellent words for this reading, asking for openness and the ability to hear, see and speak of God's recreation of the world. Fairly straightforward tune. SP&P092 Empty jar clear and clean (Manley) A simple song, seeking the openness to receive God's spirit, like water rushing through. Also to go with the James 2:1-17 reading, Kendrick's "Beauty for Brokenness". I shall try and put my "I delight to do your will" up somewhere easy to link to!